Posted by irishelectionliterature in History, Irish History, The Left. The fourth Annual Frank Conroy Commemoration. 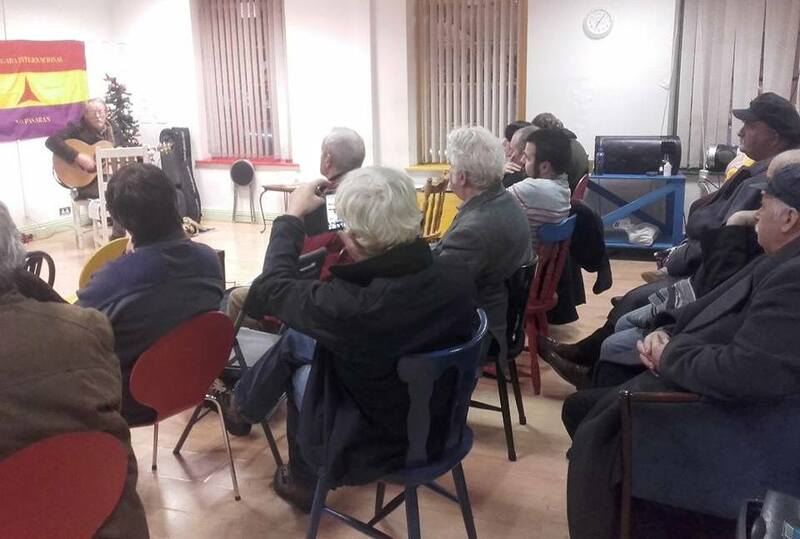 On Saturday 12th December 2015, a very interesting Frank Conroy Commemoration took place in The Liffey Studio , Newbridge. With the screening of The Republican Congress Presented by Donal Fallon and Directed by Donal Higgins . The documentary tells the story of the political organisation that was founded in 1934 by Left-wing Republicans Frank Ryan, George Gilmore and Peadar O’Donnell. whole country was supporting Franco. I also think that the Congress has some resonances for society today”. 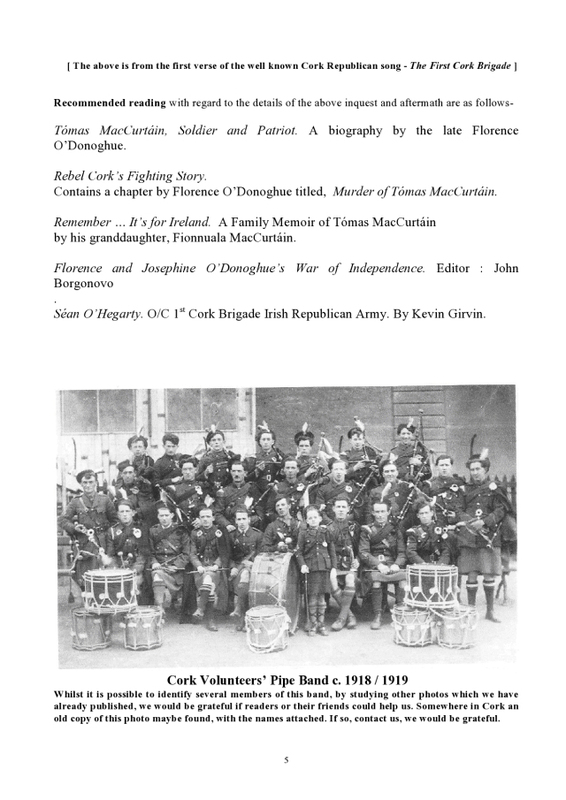 Paul McCormack sang “Men and women heard the call and went to fight for good and all and in the ranks there standing tall a young man named Frank Conroy”. As he entertained the crowd including councillor Reada Cronin, at the Frank Conroy commemoration who died in 1936 fighting with the International Brigade. Posted by irishelectionliterature in Irish History, Irish Politics. A friend (and contributor to the site and Left Archive) has done a fine piece of research on Patsy O’Connor . 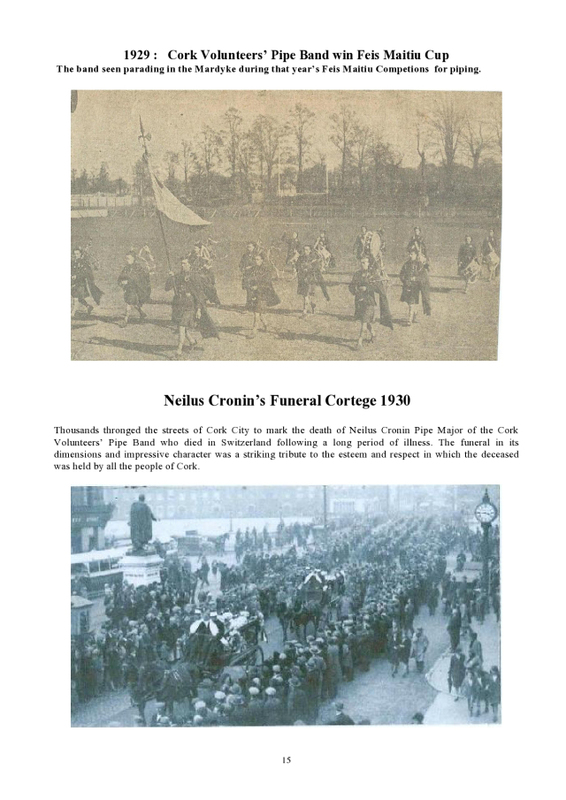 He researched a funeral that took place a few weeks previously to that of O’Donovan Rossa on the 17th June 1915 also in Glasnevin, that of Fianna Éireann member Patsy O’Connor…… and the initial enquiry took him in all sorts of directions. A lovely piece of research from an amateur historian. Posted by WorldbyStorm in Irish History, The Left. 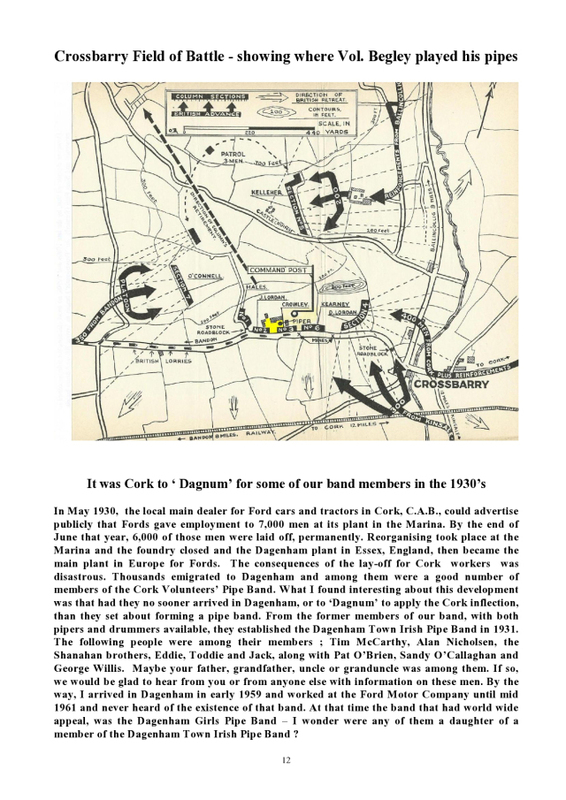 Many thanks to Brian Hanley for allowing us to reproduce this text which was given at the ILHS on 1 November 2014. Firstly I’d like to thank the Irish Labour History Society for the invitation to speak today and give my apologies for missing the earlier sessions. Now I’m not going to make any great claim to originality in what I’m going to say and I’ll be drawing heavily on work by Manus O’Riordan and John Newsinger, who though writing from different perspectives, have I think, provided the best overviews of Connolly’s wartime politics. It is not a question for me of judging James Connolly retrospectively, but discussing what he actually said, rather than what we want him to have said, in order to fit whichever political perspective we are hoping to use him for. After Connolly took over editorship of the Irish Worker in October 1914, the paper’s masthead bore the slogan ‘We serve neither King nor Kaiser.’ In the same month a banner asserting this was hung from the front of Liberty Hall and remained there until torn down by the authorities. But in the Irish Worker during August Connolly had also written that ‘Should a German army land in Ireland tomorrow we should be perfectly justified in joining it, if by doing so we could rid this country once and for all from its connection with the Brigand Empire that drags us unwillingly to war.’ (8 August 1914.) So what was Connolly’s position? His starting point was absolute opposition to the war. He promised that ‘conscription or no conscription they will never get me or mine.’ Connolly simply did not accept Allied claims of the war being for the defence of right and freedom. He, rightly I think, regarded as rank hypocrisy the idea of imperial powers holding millions in subjection lecturing people on the need to fight for them. Among other things he noted the brutal record of the Belgian Empire, in the article ‘Belgian rubber and Belgian neutrality’ for instance, in the Irish Worker of the 14 November 1914. He also denounced Tzarist Russia, calling it the ‘most brutal foe of human liberty in the world’ in the Irish Worker of 15 August 1914. During that month Connolly drew attention to one of the most glaring truths about the Russian Empire’s commitment to freedom, it’s record of anti-Semitism. He described how in Russia ‘the Jewish districts are given up to pillage and outrage by mobs of armed men, while the police looked calmly on. Shops and houses are burned after being looted, women and children are ravished, babies and old men are thrown from windows to their death’ (IW, 22 August 1914). He returned to this theme on several occasions, noting that across the world many Jewish left-wingers were taking the side of the Central Powers. Connolly republished an article from the New York Yiddish daily Warheit, which asked ‘on what side must we Jews sympathise?’ and answered that there were ‘only three nations in the whole of Europe whose people are not entirely antagonistic to Jews…Austria-Hungary, Germany and Italy’ in contrast Jews were ‘hated, persecuted and despoiled…in Russia, Roumania, and Greece.’ Now ‘cursing those who have now compelled Jew to fight Jew, and war in general, we hope and pray that the Austrian and German arms will be victorious in the struggle’ (IW, 12 Sept 1914). Now Connolly hoped that if ‘the working class of Europe, rather than slaughter each other for the benefit of kings and financiers, (should) proceed tomorrow to erect barricades all over Europe, to break up bridges and destroy the transport service that war might be abolished, we should be perfectly justified in following such a glorious example and contributing our aid to the final dethronement of the vulture classes that rule and rob the world…Starting thus, Ireland may yet set the torch to a European conflagration that will not burn out until the last throne and the last capitalist bond and debenture will be shriveled on the funeral pyre of the last war lord.’ (IW 8 August 1914). But that hope looked distant in August 1914. ‘In the middle of the last century our countrymen died of hunger in thousands…children died in ditches because famine walked the land….our desire is to prevent a recurrence of those horrors. Our land has been given over to a privileged class. It lies fallow and unfruitful. Our credit was pledged to enable the transfer to be effected. The land our fathers fought for, suffered for, bled for, died for, was brought back with our money- the money of the working class-from the people to whom it was given when our fathers were betrayed and their heritage stolen. To-day it is in the hands of the profit-mongering crows. It is tilled here and there, but the bullock roams the lands and the people flee the soil…. Irish women, it is you who will suffer most by this foreign war. It is the sons you reared at your bosom that will be sent to be mangled by shot and torn by shell; it is your fathers, husbands and brothers whose corpses will pave the way to glory for an Empire that despises you; it is you and your children who will starve at home if the produce of Irish soil is sent out of this country…to the men of our class who are armed, we say keep your arms and use them if necessary. If God created the fruits of the earth He created them for you and others. Do not allow our crops to be gleamed for any other country. They are yours. Keep them at home! Keep them at home by the strength of your right arm.’ So the desire to resist the war was shared by others with in the labour movement. But as well of course as acting general secretary of the Irish Transport Union, Connolly was also soon Commandant of the Citizens Army. The war also changed the ICA’s role. In September 1914 John Redmond and the British Prime Minister Asquith addressed a recruitment rally at the Mansion House. The ICA were mobilized, along with the Volunteers, and there was a plan to seize the building and prevent the rally happening. This plan was aborted but several thousand people, including men in uniform with arms, rallied against recruitment in College Green, while ICA member Sean Connolly led the crowd in singing ‘A Nation Once Again.’ From early 1915, at least, Connolly was determined that the ICA would begin a military struggle of some form while the world war raged. This is quite apparent in much of what he says, in public and in print. But it is important to remember that Jim Larkin, among others, was using very similar rhetoric in the early months of the war. I’ll return to this in my conclusion but it is also important to note that Connolly was central to mobilizing a public anti-war effort. In March 1916 Connolly argued that the German empire was ‘a homogenous empire of self-governing peoples’ which offered ‘more possibilities of freedom and civilization’ than its British counterpart. However he stressed that the Irish did not ‘want to be ruled by either empire.’ In part this reflected some of the widespread pro-German feeling among Irish separatists of all descriptions. 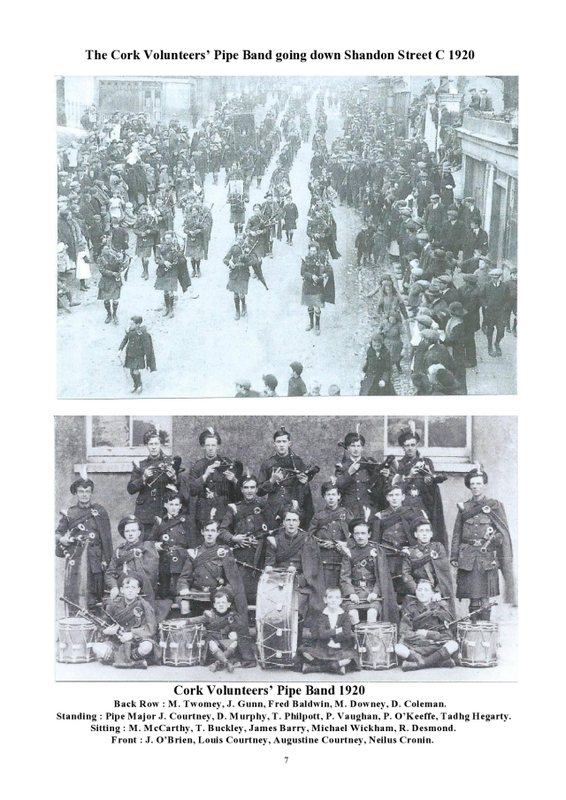 The Citizens Army used to sing ‘The Germans are winning the war me boys’ on their route marches for example. And the practical necessity of a German alliance for the Easter Rising is another question. But Connolly theoretically went to some lengths to justify his pro-German position. In December 1915 the Workers Republic even republished an interview with Kaiser Wilhelm by the SPD’s Anton Ferdrich, in which the Kaiser described socialists as ‘splendid fellows’ and asserted that ‘there is no doubt that he (the Kaiser) understands the aims of the radical left in parliament far better and has more sympathies for them than the world knows.’ Connolly’s praise for the Polish Socialist Party and its leader Pilsudski was quite open and accessible in the pages of the Workers Republic. But there is nothing of any of this in, for example, Desmond Greaves’ biography of Connolly, which simply ignores this aspect of his politics altogether, as do some contemporary Connollyites, in their quest to turn him into an Irish Lenin, or least an icon of Irish neutrality. I think these politics are perfectly understandable and in the context of their time perhaps justifiable: Imperial Germany was not Nazi Germany and the First World War was not the Second World War. I just fail to see why some people are so reluctant to talk about them today. As a former soldier Connolly might have understood that Irishmen were joining the British Army for all sorts of reasons, which did not at all imply a betrayal of their country or their class- or at least that these men were not beyond redemption. As an organizer of the Dublin unskilled in 1913 he must have understood that for the poorest of the city, ‘a few paltry shillings’ could be a matter of life or death. Though Connolly could not predict the future perhaps a less despairing world-view might have pointed towards possibilities for mobilizing far larger numbers against the war and into a movement for a new Ireland. But by this point his mind was already made up. Connolly’s martyrdom was yet another result of the great slaughter unleashed in August 1914. Posted by WorldbyStorm in Economy, Irish History, Irish Politics, The Left. 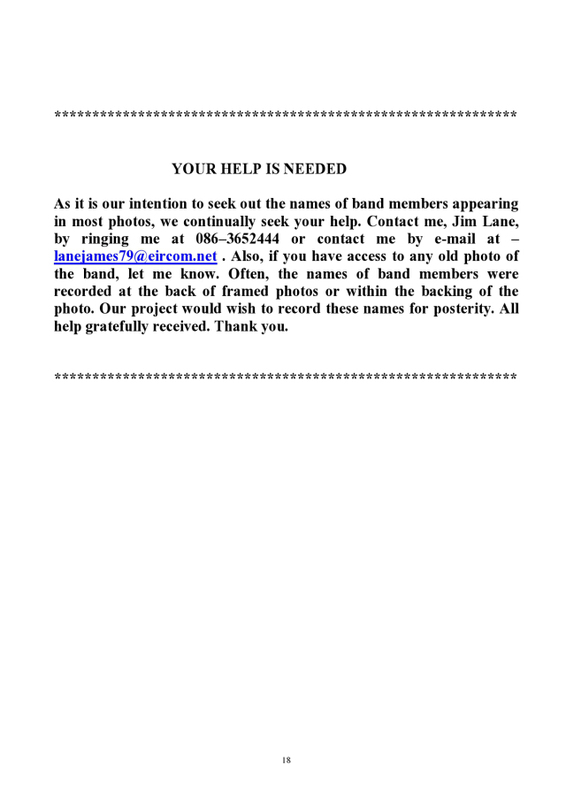 Many thanks to BH for allowing us to reproduce the text of the paper. Good morning. Firstly I would like to thank the organizers for inviting me to speak here. At least 40,000 Irish men and women died as a result of the First World War, almost 1,000 from this region alone. Thousands more were wounded and families and communities across the country directly and deeply affected by the conflict; it left scars that lasted for decades. That alone makes it a hugely significant event in our history. Indeed it is impossible to understand why the Easter Rising occurred and the way that the Irish revolution developed without discussing the war. I agree with historian John Borgonovo, who, in his excellent study of Cork city in this period, The Dynamics of war and revolution, argues that it was the First World War which fundamentally transformed Ireland. As a historian I have no difficulties with researching and discussing World War One, or with its dead being remembered. I understand the very human desire of many to discover more about their ancestors experiences of the war. Furthermore I think the conflict can be researched and discussed, as a group in Belfast working on the Connaught Rangers have argued, without it being ‘a contribution to the glorification of the senseless slaughter of the First World War. ’As far back as November 1934 the left-wing Republican Congress newspaper could assert that ‘no Irishman objects to the commemoration of those who died in the Great War.’ But the important question is what type of commemoration? This year I believe we have seen commemoration being replaced by a kind of an unquestioning nostalgia about Irish participation in the slaughter of World War One. This is partly the influence of the moves by the British establishment to recast the war as one involving defence of democracy against Prussian militarism (with the strong suggestion that this was simply another form of the Nazism that Britain fought in the Second World War). This has of course involved ignoring or downplaying the nature of the other allied powers, including Belgium’s brutal colonial record and Tzarist Russia’s tyranny. The role of Imperial Japan or the Italian empire, let alone those of Britain and France is also little discussed; but millions of colonial subjects of those empires and also of Germany and Turkey of course, found themselves at war without any consideration whatsoever of their views on the matter. A whole host of nations and peoples were bartered and exchanged as new nations were simply carved into or out of existence; by the Sykes-Picot deal in 1916 for example- look today at its legacy in the Middle East. This was an imperial conflict. But in Ireland today commemoration of the war is seen by some, very sincerely, as a tool for reconciliation, because the war involved Irishmen from north and south and from nationalist and unionist backgrounds. There are also however, others who want to downplay or ignore Ireland’s place in the British Empire and act as if there was some mandate for ‘our’ participation in 1914-18. This is accompanied by a cynical attempt to convince us that the over 200,000 Irish people (and they were not just men) who took part in the war were completely airbrushed from history, until, as the RTE website informs us ‘this year.’ This view, which reflects a more complex reality about remembrance and forgetting, plays again on the genuine interest of people in their family history and suggests that it is being hidden from them. And finally commemoration of the war is often presented as apolitical and natural. I would argue that the war was never forgotten in nationalist Ireland but was remembered largely as a waste of life, as a mistake, as something that Irish people should not have taken part in. And that’s the way I believe it should be remembered. Much of the contemporary commentary on the war is part of an effort to make us see it as something else. But the state that emerged here after 1921, whatever we think of the Civil War or the nature of the Pro and Anti-Treaty sides, emerged because of a rejection of Empire, inspired to a great degree by revulsion at the war, which discredited British rule in Ireland. Well before the war was over, most Irish people regretted that John Redmond had promised nationalist support for the war effort. It is also useful to ask why Irishmen were in the British Army in the first place? This question may seem obvious but is often overlooked in mainstream commentary. Irishmen went to war as part of the British military machine, because of decisions made in London. There was no even-partially independent Irish parliament to rubber-stamp ‘our’ participation. If there had been I think supporting the war would still have been wrong, but given that there wasn’t even that fig-leaf of democracy, all discussion of Ireland’s participation should reference this. And yes, Irishmen had participated in Britain’s military for generations, but what did this mean? A future president of this state, Sean T. O’Kelly, put it like this to a meeting of Indian nationalists in New York during 1924 ‘we must feel under deep obligation to work for India and for Egypt until both are free…we owe a deep debt to these countries, for has it not been largely by the work of Irish brains and Irish brawn and muscle that these two ancient peoples have been beaten into subjection and have been so long oppressed…Our Indian friends, could, if they wished, tell us many heart-rending stories of the brutalities practiced upon their peoples by English regiments bearing names such as Connaught Rangers, Munster Fusiliers, Dublin Fusiliers…Egypt has the same sad stories to tell to our disgrace. Until we Irish do something practical to make amends for the wrong doing …that shame will rest with us.’ Irish participation in imperial service is not something to be proud of. In asking how we would we commemorate those who took part, we have to ask why did they take part? It is tempting and satisfying in some ways to charge that John Redmond was responsible for their participation and the resulting losses. But I would counsel caution and suggest that despite his own best efforts, argue against conflating John Bruton with John Redmond. Why? Because if we think that nationalist Ireland essentially supported a version of John Bruton’s politics in 1914, or we imagine that the Home Rulers were Unionists, then I don’t think we can understand how by 1918 people rejected the war and endorsed the idea of independence. 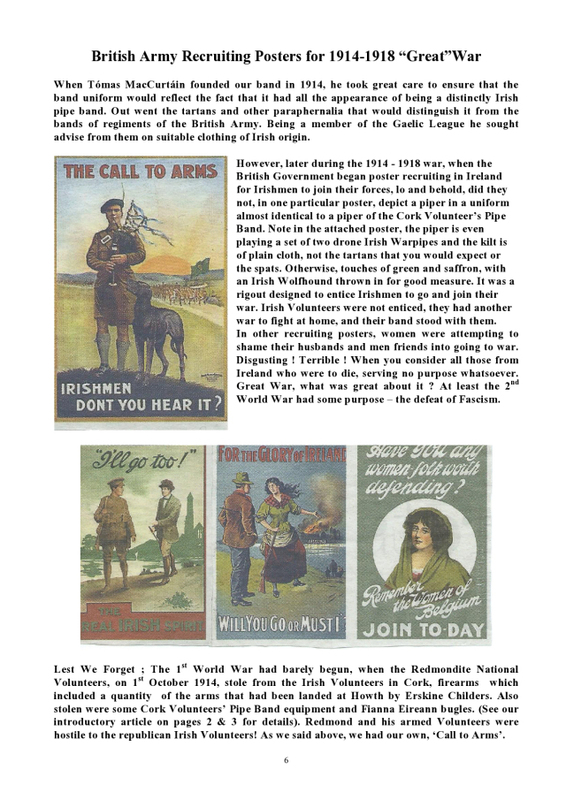 We are more familiar with later versions of the Redmond brothers, with John Redmond arguing that Home Rule would guarantee Britain a loyal friend within the Empire and William Redmond dying in British Army uniform in Belgium during June 1917. But the movement that John Redmond led was an Irish nationalist movement, whose anthem was ‘A Nation Once Again’ and one of the contradictions of Home Rule is that many supporters of the Irish Party expected it to mean far more than it would have in practice. John Redmond’s professions of imperial loyalty were real, (though sometimes intended to impress a deeply suspicious British audience) but such loyalty was not necessarily felt by many of the party’s supporters. It might surprise some that perhaps ¼ of Home Rule MPs in the early 1900s were ex-Fenians. This was no secret because the party regularly trumpeted its radical past. Indeed it was the Home Rule party which had monopolized the annual Manchester Martyrs commemorations. They protrayed themselves as the inheritors of the Irish revolutionary tradition. As Willie Redmond asserted in 1910 under Home Rule ‘the aspirations of our race will be realised, and…the struggle of the men of ’98, of ’67, of ’48 and of Parnell will be rewarded.’ Nor did the party endorse recruiting in Ireland. As William Delaney the MP for Ossory, put it in 1905 ‘if they joined the Army they would be sent out to fight for the great British Empire, and afterwards they’d get two pewter medals and sixpence a day for five years and they’d die in the workhouse.’ Hence in 1914, unlike Tory, Unionist or Liberal MPs, very few Home Rulers had any worry about being called up as reservists. At various stages Thomas McDonagh, Joseph Mary Plunkett, Rory O’Connor, Sean MacEoin, Patrick Little, Francis and Hannah Sheehy-Skeffington had been members of branches of the Home Rule party, while Sean MacDiarmaida was a member of the Ancient Order of Hibernians until 1906. The distinctions between ‘constitutionalist’ and separatist were often blurred before 1914 and Home Rule rhetoric about ‘Cromwell’s work being nearly undone’ conjured up visions of much more than limited devolution within the Empire. This is not to ignore the deeply reactionary aspects of other parts of the Home Rule movement’s politics, such as its role during the 1913 Lockout or its leader’s opposition to Women’s suffrage, but to try and understand them in the context of their time not as part of our modern polemics. Before Redmond said anything about the war, there were around 50,000 Irishmen already serving in the British military, and the thousands who were called up initially in the winter of 1914 were reservists, or ex-soldiers. These included at least 1,000 members of the Irish Transport Union, among them members of the Citizen Army; as the Irish Worker lamented ‘some of our best comrades are leaving the North Wall to fight for the glory of England.’ Another 1,000 former ITGWU men would be in British uniform by 1915. During 1914 around 26,000 Ulster Volunteers joined up, as did thousands of other men from Unionist backgrounds, from across Ireland. Redmond can’t be blamed for that either. The war had devastating impact on southern Protestants: a visit to any Anglican Church will show you that. About 24,000 members of the Irish Volunteers did join, most of them probably after Redmond’s Woodenbridge speech. And some nationalists did accept Redmond’s reasoning for supporting the war. The former MP Tom Kettle argued that ‘this war is without parallel…France is as right now as she was wrong in 1870. England is as right now as she was wrong in the Boer War. Russia is as right now as she was wrong on Bloody Sunday.’ Kettle enlisted the Royal Dublin Fusiliers and was killed at the Somme in September 1916. Francis Ledwidge, a founder of the Co. Meath Labour Union, and an early recruit to the Slane Irish Volunteers, initially supported Eoin MacNeill’s section of the movement. But he enlisted in the Royal Inniskilling Fusiliers in October 1914 later explaining that ‘I joined the British Army because she stood between Ireland and an enemy common to our civilization and I would not have her say that she defended us while we did nothing at home but pass resolutions.’ He was killed at Passechendalle in July 1917. (Though not before reassessing his views on the war). And here we can discuss class and economic factors and the impact of communal pressure, as when the Dean of St Patrick’s Cathedral exhorted Irish women to ‘shun those who would not volunteer for service, to visit them with severest disapproval, and when they expect a smile, just look them straight in the face and turn away.’ (This pressure probably existed more within the Protestant community.) But what was noticeable in 1914 was a change in the nature of recruitment. 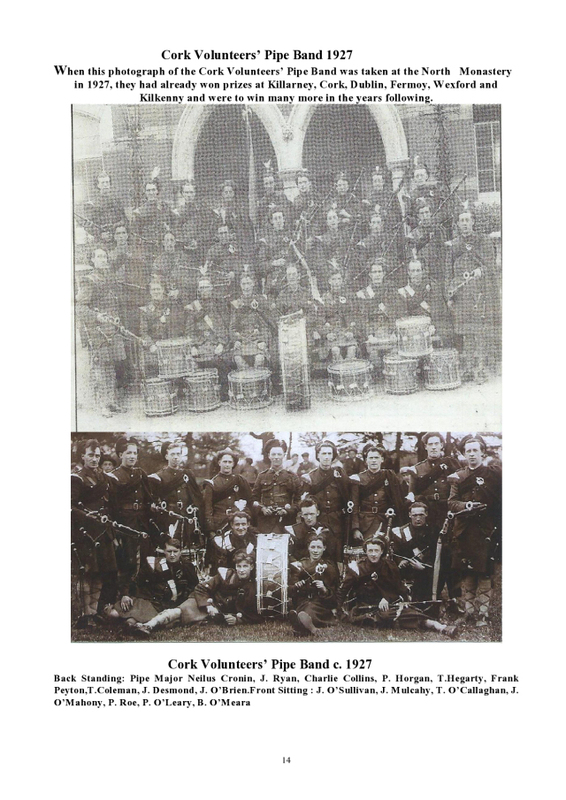 Ernie O’Malley, whose brother was an officer in the Royal Dublin Fusiliers, noted that ‘Before the war, scapegoats, those in debt or in trouble over a girl joined the ranks: now all trades, professions and classes were found there.’ So over 3,000 Trinity students or graduates joined up and about 400 of them were killed. The 10th Commercials Battalion of the Royal Dublin Fusiliers was nicknamed the ‘Toffs in the Toughs’ because it was drawn from men from business or white-collar occupations. 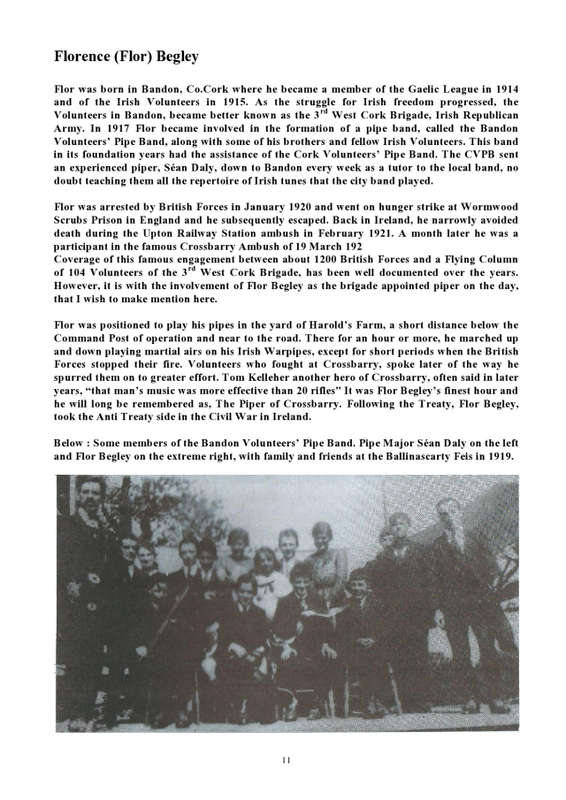 Over 250 men were part of the Irish Rugby Football Union volunteer corps; 46 former members of the Trinity rugby club were killed, along with 24 members of Clontarf. The Catholic middle-class were not unaffected. 47 ex-pupils or staff from Dublin’s Belvedere College died in the war. But after the initial surge of enlistment, it began to develop a familiar pattern. By 1915 the War Office was noting that Irish ‘recruiting is slow and almost entirely confined to the towns.’ Of the 169 recruits from Dublin Corporation, just nine were ‘salaried professionals’ while 113 were unskilled labourers. Even in wartime the army meant for many a pay rise, a chance to learn a trade and a separation allowance for wives and families. And class mattered in a while range of other ways. In January 1916 Lieut Moorhead of the 10th Dublin Fusiliers (the Commercials) told a women’s recruitment meeting that ‘he’d been through the ranks himself, and he found that it was a not a very pleasant place for men of education and refinement to be huddled together with men who had probably not washed for a couple of months. He came to the conclusion that there was a large number of men who did not join because they did not care to be mixed up with the corner boys, and he got his colonel to allow him to form a company… of these better class men.’ British enlistment officers complained in August 1915 that in Ireland ‘a much larger number of recruits could be obtained from the (farming and commercial classes) if it were not for their reluctance to enter upon their training with recruits from the labouring classes. This class prejudice is probably much more pronounced in Ireland than elsewhere in the United Kingdom.’ Not much evidence of shared sacrifice there. Nevertheless many Irish war veterans were proud of their service, proud of what they and their friends had been through together and retained a sense of comradeship long after the war was over. But they did necessarily identify with support for British policy in Ireland. 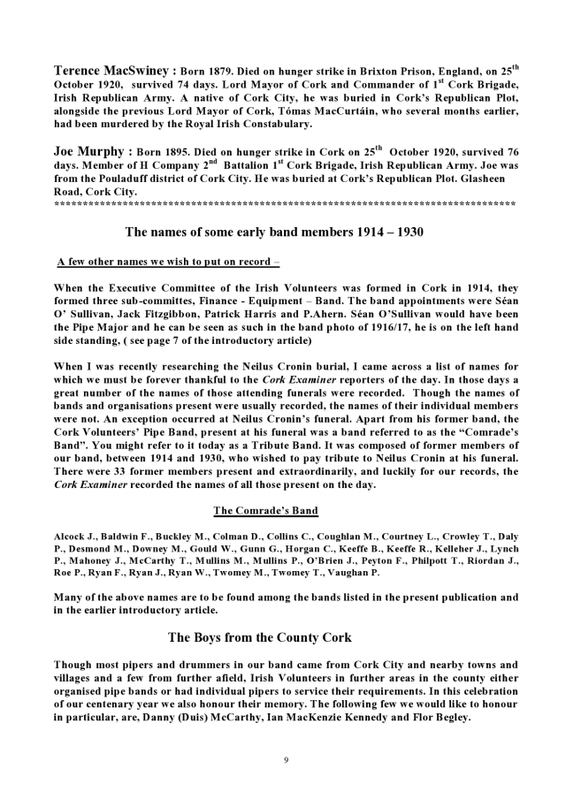 Nationalist ex-servicemen in Cork for instance, formed their own organization in order to be independent of the Royal British Legion. Their demonstrations were often stewarded by the Republican Police and in 1920 they were involved in bloody rioting against the British Army after one of their members was shot dead by troops. 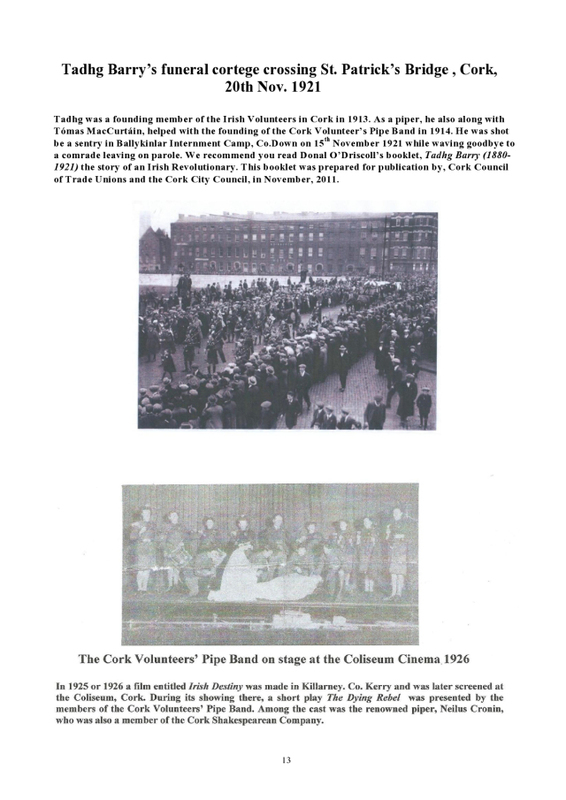 During July 1919 2-3,000 members of the Irish Nationalist Veterans Association met in Dublin’s Mansion House calling for a boycott of the city’s victory parade. Tom Kettle’s widow, Mary, questioned why ‘soldiers were asked to march past College Green, their own House of Parliament, where their rights were bartered away, to salute Lord French, not as an Irish soldier, but as Lord Lieutenant and head of the Irish Executive, which was responsible for the rule of coercion in this country and for the betrayal of every Irish Nationalist soldier who fought and fell in the war. Did any Irish Nationalist fight for any country except the country of his birth?’ (Cries of “No, no’). If they went on the side of England it was because they thought for the first time in her history the grace of God was operating in her, and she was at last about to take the side of honour in the world’s conflict. 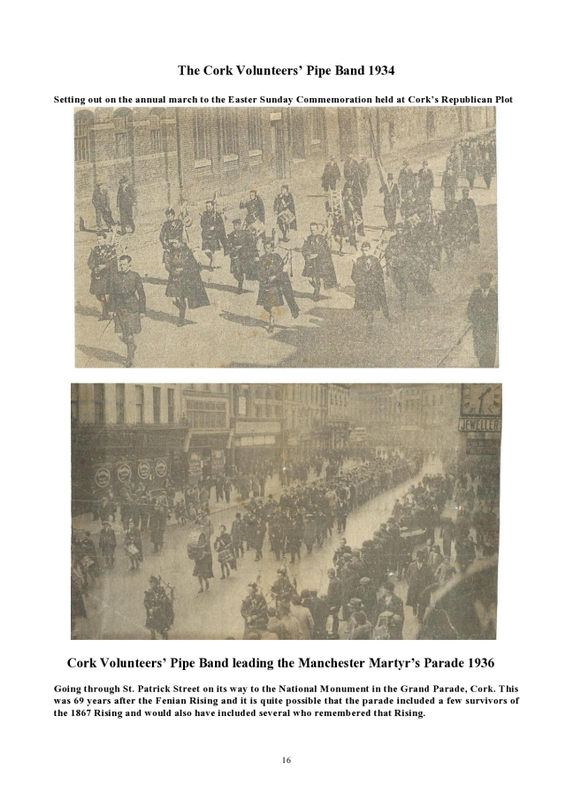 She hoped, in honour of her husband’s memory, not a single Dublin Fusilier would march in the procession. 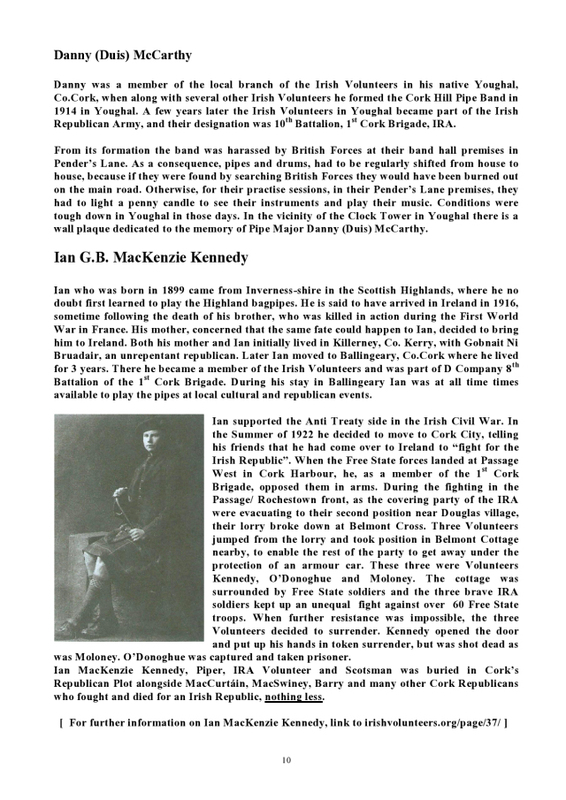 If it had brought about an Irish settlement they would march proudly; such was not the case; but, on the contrary, they were asked to join and unite with the army of occupation.’ While Tom Kettle is often held up as emblematic of Irish nationalist sacrifice in the war, his widow’s disillusion is less widely referenced. The experience of other veterans was different. Sergeant Patrick O’Hare from Belfast was a career soldier with 16 years service in the Connaught Rangers, including during the Great War. In July 1921 O’Hare and his family were driven from their home in Urney Street by an armed Loyalist mob. Despite being in his army uniform at the time, O’Hare was told he was going to be shot and his family were forced at gunpoint to leave their house. The likelihood is that O’Hare’s attackers also had war veterans among their ranks. 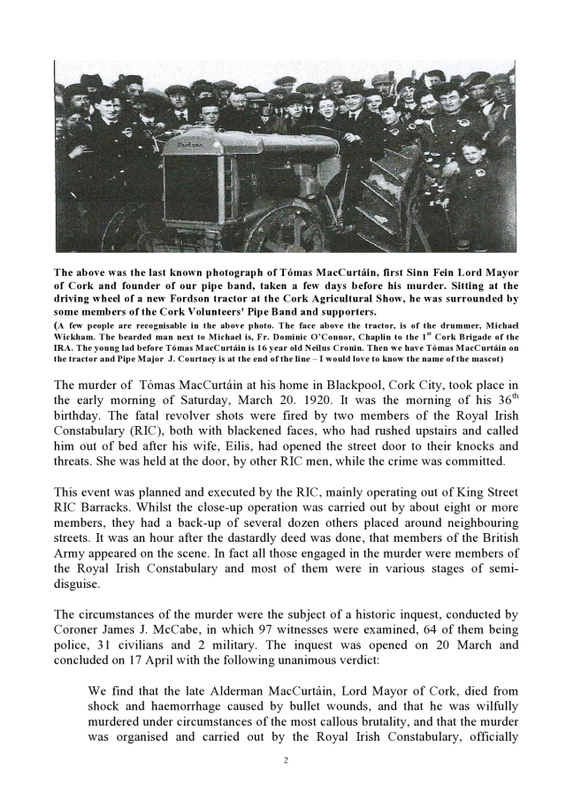 Ex-servicemen were prominent in the violence in Belfast from 1920-22, as IRA members, as nationalist vigilantes, as Loyalist paramilitaries, as Special Constables, as RIC men and back in British uniform as soldiers. One of the ways in which Unionist politicians stirred up tension among workers, which exploded into violence in 1920, was to claim that Protestant ex-servicemen had lost their jobs to disloyal ‘Sinn Feiners’. There were of course other ex-soldiers and officers of the British and Commonwealth armies in Ireland in this period; the Black and Tans and Auxiliaries. Padraig O’Ruairic has written a history of Clare during the revolution and he is one of the few to try and list locally recruited Tans and Auxies. Over 60 men from Clare served with these formations, the majority of whom were Catholic ex-servicemen. There were over 1,000 recruits to these forces across Ireland and it would seem likely that most were Irish war veterans. 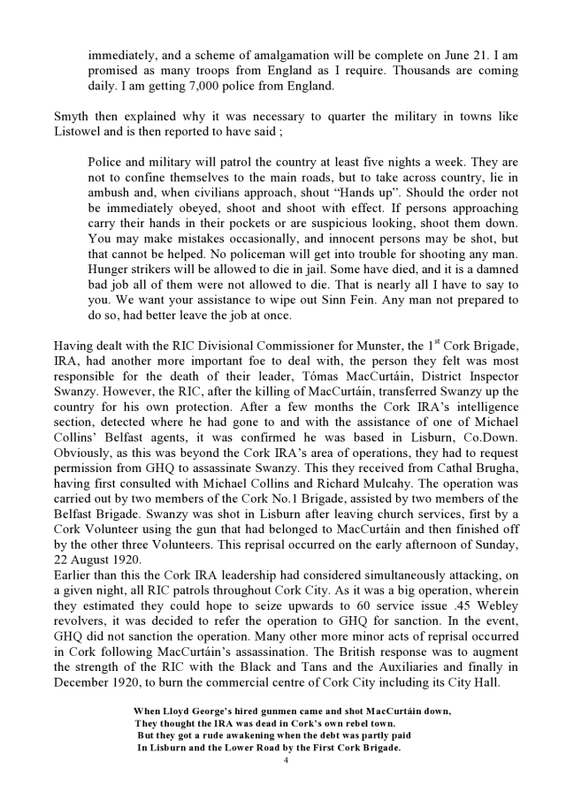 During the War of Independence some ex-servicemen were killed by the IRA as alleged informers and others were killed by Crown forces for various reasons; some veterans were involved in labour and land agitation and some were landowners and employers. Some remained supportive of the Home Rule party and its successors well into the 1920s, while very many probably kept their heads down and got on with their lives. The 200,000 or so war veterans were divided by politics, religion and class. In the Civil War from 1922-23 up to 30% of the new Free State Army were ex-British soldiers, mostly war veterans. They were key to the organization of that army in the early stages of the war. The Free State Army also recruited heavily from the same towns where the British Army had drawn their soldiers. This was of course noted in Anti-Treaty propaganda, (though most of the worst atrocities against republicans were not carried out by these ex-servicemen; the core group around Michael Collins Squad did most of those). There were still ex-British soldiers on the Anti-Treaty side. Famously there was Erskine Childers but not just him, and Pro-Treaty propagandists were also quick to point out examples of Anti-Treatyites being ex-British soldiers. We know of course that the IRA man who more than likely fired the shot that killed Michael Collins, Denis ‘Sonny’ O’Neill, was a war veteran. But what this illustrates is that there is no apolitical or value-free way in commemorating these men. Their war service did not unite and I do not think we should try and unite them retrospectively. Asserting that the war was forgotten also means ignoring the huge commemorations, up to 40,000 strong, that took place every year in Dublin (and some other towns) until 1939. Certainly in the 1920s the commemorations on 11 November involved thousands of ordinary ex-servicemen. But they were highly political Unionist demonstrations, bedecked in poppies and Union Jacks, and therefore always contentious. 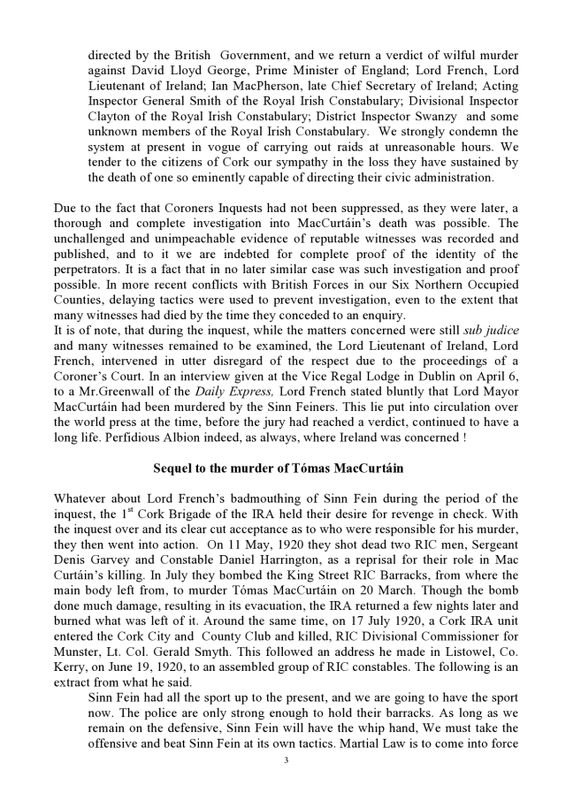 As a senior Gardaí complained in 1928 the ceremonies were ‘a regular field day for these persons…if the Irregulars adopted such tactics they would be arrested under the Treasonable Offences Act.’ In 1932 the Garda commissioner alleged that the commemorations were in fact an occasion for ‘anti-Irish and pro-British sentiments.’ (The two Gardaí concerned were David Neligan and Eoin O’Duffy). That sentiment was growing in Ireland well before 1916. As historian Keith Jeffrey suggests, there was a ‘progressive disenchantment with the war itself, and the growing feeling that the continued prosecution of England’s- or the Empire’s – war had little specific to offer Ireland.’ The impact of the carnage at Gallipoli for instance, had a deep effect in Dublin. Katherine Tynan, a Catholic Unionist and supporter of the war recounted how ‘for the first time came bitterness, for we felt that their lives had been thrown away and their heroism had gone unrecognized…Dublin was full of mourning.’ In September 1915 Dublin Corporation passed an anti-conscription motion by 31 votes to 7. It is significant that most Home Rule MPs were clear from the beginning that conscription would not be tolerated and many were far less enthusiastic recruiters than John Redmond. By 1915 the Catholic hierarchy, whose ability to monitor their flock’s feelings should not be underestimated were also far more critical of the war. Widespread wartime censorship and repressive legislation created resentment in nationalist Ireland. But there were also other effects of government policy. Deficit spending created massive inflation and led to demands for wage rises and hence to strikes; wartime government arbitration actually encouraged the growth of trade unions (the revival of Irish Transport and General Workers Union after 1913 being part of this process). On the land rents increased and rising food prices hurt farm labourers, encouraging them to join unions and take part in strikes. Though often forgotten, popular involvement in movements like the Peoples Food Committees during 1917 did much to radicalize opinion. By the time the British government finally attempted to introduce conscription in 1918 large sections of the population were in open defiance. In Ireland we can actually point to a concrete example of lives being saved by anti-war agitation; the anti-conscription strike of April 1918. Had conscription not been stopped, then several thousand more Irishmen would certainly have died at the front. A united campaign against conscription had been declared at the Mansion House in Dublin on April 18th, involving Sinn Féin, most of the Home Rule factions and the unions with the significant backing of the Catholic Church. Two days later 1,500 delegates at a special Labour convention backed call for general strike. The strike was organized within three days, despite press censorship and in most of the country only banks, law courts and government offices stayed open. It involved most sectors of the economy and members of British based unions along with their Irish counterparts. As even the Irish Times admitted ‘it was the voice of Labour, not the voice of religion or politics, which yesterday stopped the wheels of industry…We think that April 23rd will be chiefly remembered, not as the day when Nationalist Ireland proclaimed her spiritual and moral isolation, but as the day when Labour found itself.’ When we remember the war this is one occasion we should surely celebrate. Finally however I think we need to be prepared to critically discuss not just the politics of the war but also the politics of those who opposed it. While I disagree very strongly with John Bruton’s analysis I think that questioning interpretations of history is valid. Easter 1916 is not a religious event- it is not sacred. Neither are the politics of those involved. I think we should debate what Sinn Féin, the Irish Republican Brotherhood and James Connolly actually thought about the war. The phrase in the Proclamation about our ‘gallant allies in Europe’ was not there to fill space. It was written in the belief that the Central Powers would win the war and that their reshaping of a new Europe would include an independent Ireland. This was of course a huge hostage to fortune and would haunt Sinn Féin as it sought admittance to the post-war conference at Versailles, and when de Valera argued for recognition for the Republic in the United States. But the idea of a successful rebellion in 1916 was predicated on German aid. In 1915 Roger Casement and Joseph Mary Plunkett had presented the ‘Ireland Report’ to the Germans, arguing for a naval landing in the west of Ireland, involving at least 12,000 German troops. How seriously the Germans took the plan is open to question but the assertion that German aid was coming was crucial in convincing waverers to support an uprising in 1916. During the fighting in Dublin itself the belief that the Germans had landed and were on their way was key to keeping up morale. Most Irish separatists were anti-imperialists as far as Britain was concerned, but were less interested in imperialism elsewhere. The Citizen Army could sing ‘The Germans are winning the war me boys’ on their route marches without any real consideration of what the Germans winning the war might mean. The main concern of Irish separatists, naturally enough, was with the imperialism that they were fighting. Similarly if we can’t get beyond reducing James Connolly’s opinions on the war to the admittedly brilliant slogan ‘Neither King nor Kaiser’, then we are also doing him a disservice. Connolly’s position on the war changed fairly rapidly from despair at the collapse of European socialism, to not just support, but apologia, for Imperial Germany. There is no doubt that from September 1914 Connolly not only desired a German victory over Britain, which was a logical enough position, but also that he eulogized Germany as a modern, progressive state and ignored or played down the reactionary nature of German imperialism, including that of its empire. In this Connolly was allying himself, not with the German anti-war left, but the pro-war right of the Social Democrats. A century on we should surely be able to discuss this. Posted by WorldbyStorm in Irish History. Dr Maurice Manning said the expert advisory group had been impatient for a while about the failure to bring forward a blueprint for marking the centenary of the Easter Rising which occurs in just 18 months time. “It is time for things to happen,” he said. Historian Professor Diarmaid Ferriter, who is also on the committee, wrote in his Irish Times column yesterday about complaints from relatives of the 1916 combatants who said they were being kept in the dark about plans for the Rising centenary. This, in a way, is no surprise. There’s been a remarkable hesitancy – remarkable, if not entirely unexpected, about all these matters. Part of that is, as the piece, notes funding, part of it is – one suspects – political – the question being who will oversee these events come the time. If this government does last out its term it could just about be in pole position to take the lead, if not, well, who knows where we will stand. So perhaps there’s a wish to try to constrain them in some way – perhaps to, as it were, depoliticise them, as best as is possible in advance. Whether that is tenable is open to question. But being involved in an institution with a tangential link to this it seems to me that there’s a broad range of events and suchlike already in motion whatever about the more/most official manifestations of commemoration, and which may – in the long run, have a greater impact. It’s certainly generating enormous interest and a sense that ‘everyone’ on the cultural/historical spectrum intends to link in in some way to the overall commemoration process. 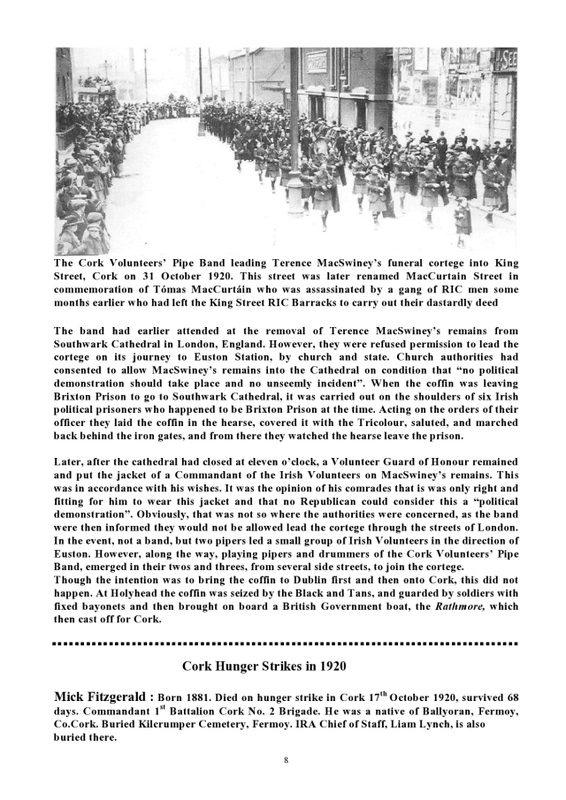 Posted by WorldbyStorm in Irish History, Uncategorized. 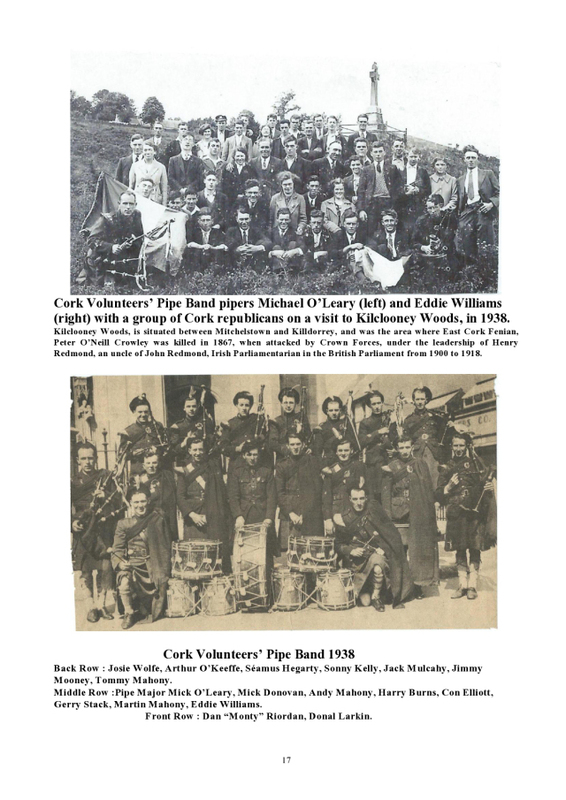 Many thanks to Rebel Cork’s Fighting Story for allowing us to reblog this. 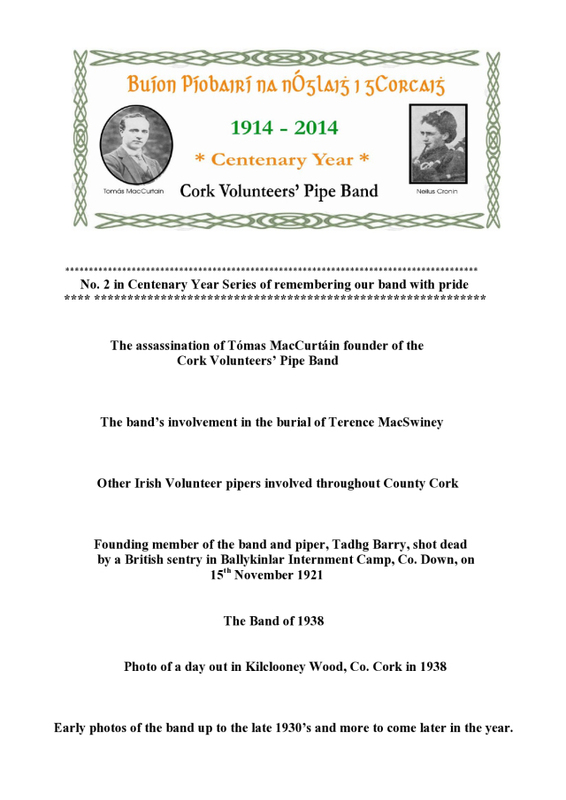 “No.2 in Centenary Year Series of remembering our Band with pride” By Jim Lane. Useful piece on Vincent Browne on TV3 with a range of guests including some not unknown in this parish discussing Irish record as an independent state in the context of Scotland’s bid for independence. Got to say the panellists gave Browne a real run for his money. Refreshing. Just to let you know that the first seminar of the new term will take place on Wednesday September 24th with a paper by Tim Pat Coogan. The title of his paper is as follows: What is wrong with Irish historians? The seminar will take place at 4.00p.m. in the Neill Hoey Seminar Room, Trinity Long Room Hub Arts and Humanities Research Institute, TCD. Please find attached a full list of the seminars for this term. Bruton, Myers, O’Cuiv and Michael McDowell. Oh yes. The Phoenix makes a most interesting point in regard to the Commemoration Wars that hadn’t struck me fully. It notes that far from John Bruton’s herculean efforts to see Redmond and the 1914 Home Rule Act ‘commemorated’ being welcomed by Unionists, it is – naturally enough, once one considers it – entirely anathema to them. Did no one tell him Ulster Unionists were agin Home Rule? For Home Rule was, from their perspective, the wedge from which all else follows. Their implacable antagonism wasn’t to Republicanism in 1913 onwards, because that was so utterly far-fetched as an outcome as to be near enough pointless to rail against. It was instead against the rather insipid level of home rule that London was prepared to acquiesce to for the island (and even then only grudgingly). Home Rule, then, as it were, is the original sin, and while all else from then on compounds it, it does not overshadow it. But in a way this is a perfect example of how the complexities of the history, then and now, serve to undercut assumptions. Bruton has often implicitly appeared to suggest that somehow recognising the parliamentary struggle of Redmond and the IPP would be a good thing because that struggle had it borne fruit would have allowed for a more pacific outcome on the island and ultimately the scope for a greater degree of reconciliation North and South. But as the Phoenix notes, that is to almost entirely misunderstand the socio-political dynamic at work.For Unionists Home Rule wasn’t simply an alternative political approach, it was an existential threat. That Bruton cannot see this, so bound up he seems to be in the process of British democracy, such as it was (and see other posts on this topic on this site for more on that), and the parliamentary area in particular, is telling. Even that must seem a mockery to Unionism, because after all Redmond’s explicit purpose was to shift much of the focus from Westminster to Dublin, even within Empire, and in so doing use Westminster to undermine the Union. Small wonder Unionists would want nothing to do with any such commemoration. Fascinating that that fairly significant problem wouldn’t be appreciated. Including the British and Ulster Unionists in all commemorations and discomfiting Sinn Féin seems to be the objective. But that may not be quite as discomfiting as it may at first appear. After all, SF has leapfrogged into a position where it is the primary voice of nationalism in the North and has significant representation in the South. They too are invited to these feasts, as it were – discomfited or not, and that is token too as to how matters have changed. But then – returning to Bruton – this seems to me to be of a piece with many of a similar ilk to Bruton who simply do not appear to grasp what Unionism is and is not. They seem to believe that because Unionists were – in many respects ironically – to accept a form of Home Rule in Northern Ireland with Stormont that they therefore somehow are closer as a political tradition to Home Rule, the IIP, etc. Anything but. They were mortal enemies of same, and were willing to countenance an open rupture with the British state to forestall the eventuality that it might succeed. That they did accept Stormont, and indeed come to more than tolerate it was as much due to necessity within circumstances as anything else. But it’s worth noting that armed confrontation of sorts on the island in the 1910s long pre-existed 1916 and even in the absence of 1916 and the push towards advanced nationalism would have continued to exist.